Poland will further support the European aspirations of Ukraine. 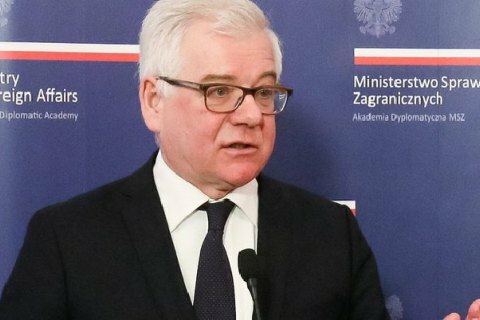 The newly appointed foreign minister of Poland, Jacek Czaputowicz, in a telephone conversation with Ukrainian Foreign Minister Pavlo Klimkin expressed hope for a speedy settlement of historical issues in relations between the two countries. "Minister Czaputowicz confirmed Poland's commitment to the sovereignty and territorial integrity of Ukraine," the press service of the Polish Foreign Ministry said in a statement on Thursday, 11 January. The Polish minister also expressed hope for an early resolution of historical issues in Poland-Ukraine relations and stressed Warsaw's readiness to continue supporting the European aspirations of Kyiv. Czaputowicz, at the request of the Hungarian side, has talked to Hungary's Foreign Minister Peter Szijjártó. Ukraine's Foreign Minister Pavlo Klimkin on Wednesday said he was planning to meet Czaputowicz soon to discuss the strengthening of partnership between the countries. He did not specify the exact date of the meeting.